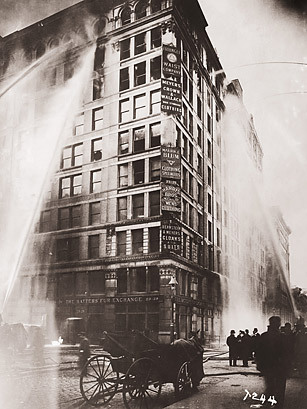 It was bad enough that the owners of the Triangle Shirtwaist Co., Max Blanck and Isaac Harris, profited from their factory's sweatshop practices  many immigrant women and girls worked brutally long hours for very little pay  but in order to prevent workers from making off with their products, the doors of the New York City factory were locked from the outside. On March 25, 1911, a fire broke out in the clothing factory and hundreds of workers were trapped in the burning building. The fire, which began on the eighth floor, left workers on the top floors especially in danger, as fire-truck ladders at the time could only extend up six stories. Many workers were forced to choose between jumping to their death and waiting for the flames to engulf them. In total, 146 employees died and Blanck and Harris were charged with manslaughter (though they were not convicted). The incident prompted an increase in factory health and safety practices.